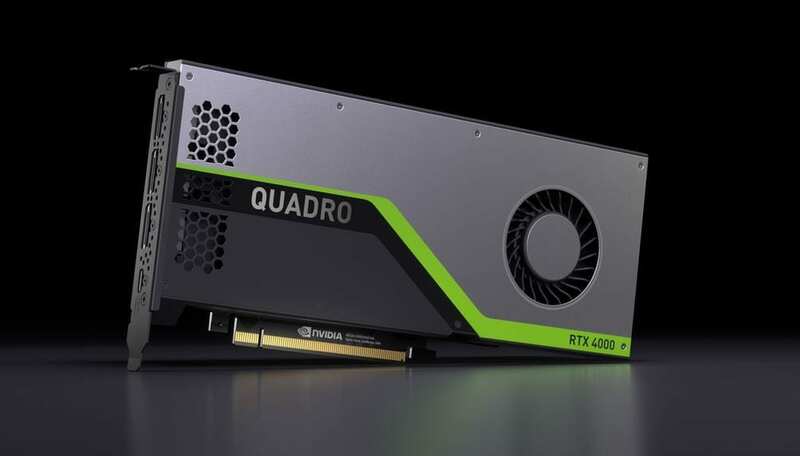 NVIDIA announced its new Quadro RTX 4000 graphics card for workstation professionals at the annual Autodesk University Conference in Las Vegas yesterday. This is the company’s first mid-range professional GPU in Quadro RTX family that is powered by the NVIDIA Turing architecture and the NVIDIA RTX platform. The Quadro RTX family already consists of the Quadro RTX 8000, RTX 6000, and RTX 5000. The single-slot design of the new Quadro RTX 4000 allows the GPU to fit in a variety of workstation chassis. “Meet today’s demanding professional workflows with GPU accelerated ray tracing, deep learning, and advanced shading. The NVIDIA Quadro RTX 4000, powered by the NVIDIA Turing architecture and the NVIDIA RTX platform, delivers best-in-class performance and features in a single-slot PCI-e form factor. Design and create like never before with faster time to insight and faster time to solution,” NVIDIA said. According to specifications provided by NVIDIA, the graphics card has 36 RT cores to enable real-time ray tracing of objects and environments with physically accurate shadows, reflections, refractions, and global illumination. Further, it packs 2,304 CUDA cores, 288 Turing Tensor Cores for 57 TFLOPS of deep learning performance, and comes with 8GB of ultra-fast GDDR6 memory that provides over 40 percent more memory bandwidth than the previous generation Quadro P4000. It also supports video creation and playback for multiple video streams with resolutions up to 8K. In addition, it provides hardware support for VirtualLink, improved performance with VR applications, including Variable Rate Shading, Multi-View Rendering and VRWorks Audio, and more. In terms of performance, the Quadro RTX 4000 offers up to 43T RTX-OPS and 6 Giga Rays/s. The FP32 compute performance is estimated at 7.1 TFLOPS, which translates into a boost clock of around 1540 MHz. The TU106-based Quadro has a 160W rated TDP and has been enclosed into a single-slot cooling solution, which should easily fit in any workstation case. It draws power from a single 8-pin PCIe power connector. The Quadro RTX 4000 will be available starting December on nvidia.com at an estimated price tag of $900. It will also be available from leading workstation manufacturers, like Dell, HPE and Lenovo, as well as its authorized distribution partners in North America, Europe, and Asia-Pacific.